If you’re one of the handful of people wondering whether the departure of chief strategist Steve Bannon would change Donald Trump—or if you have to play one on television—you got your answer Tuesday night, as Trump reprised his greatest racist hits for an adoring Phoenix crowd that didn’t come close to filling the Convention Center. Just 24 hours after he gave a somber speech breaking a campaign promise to stop the war in Afghanistan, a manic, occasionally unhinged Trump tried to get his base to forget all the bad news and focus on what they still have in common: hatred of immigrants and the media. The event’s only news had to do with whether Trump would pardon disgraced former Maricopa County sheriff Joe Arpaio, who was convicted of criminal contempt last month for ignoring a judge’s orders that he stop detaining people he suspected were illegal immigrants. Trump’s press office put out word, just before the rally, that he would not pardon Arpaio, at least not there on the spot. But he had kind words,nonetheless, for his friend, who campaigned for him last year. “Do the people in this room like Sheriff Joe? So was Sheriff Joe convicted for doing his job?” he asked. (The ACLU immediately tweeted: “No, he was convicted for violating court order for discriminating against Latinos.”) Then he teased the crowd: “You know what, I’ll make a prediction: I think he’s going to be just fine,” Trump said. “OK? But I won’t do it tonight, because I don’t want to cause any controversy. But Sheriff Joe should feel good.” So he didn’t pardon Arpaio, but he essentially promised to, and the crowd went home confident he would. 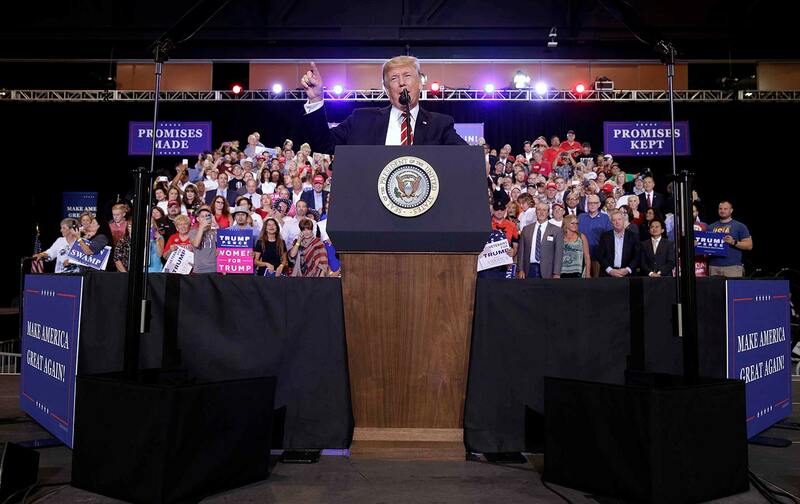 There was nothing in the speech that wasn’t a staple of Trump’s campaign rallies, except his newfound devotion to preserving Confederate monuments. Where candidate Trump supported taking down the Confederate flag in 2015, President Trump is now a crusader to preserve monuments to treason; in Phoenix he accused those who would remove them of trying to obliterate “our heritage and our history.” Somehow the man from Queens, New York, now claims the Confederate revolt as his heritage and history. Trump seems to be going all out to prove his racial bona fides since the news first broke that he was about to get rid of Bannon, at the behest of his new chief of staff, John Kelly. Kelly got kudos for winning that battle with his boss; as a prize, he’s gotten the honor of standing with Trump looking ashamed as the president repeatedly refuses to attack Nazis and white supremacists. The Phoenix rally seemed like one more stop on Trump’s “I don’t need Steve Bannon; I am Steve Bannon” tour. He even promised to “close down our government” if that’s what’s necessary to build his mythical wall on the Mexican border. Still, I had to wonder whether, with Bannon in the White House, Trump might have defied Kelly and his handlers and pardoned Arpaio right then and there. Sure, the crowd got the message that he intends to pardon the local racist hero at some point down the road, but he pulled the dramatic punch of doing it right there, critics be damned. Has Trump been cucked? Bannon’s Breitbart will be the first to tell us. Clearly, Trump traveled to sweltering Phoenix in August because it doesn’t feel as hot as Robert Mueller’s Washington. He’s headed to Reno, Nevada, for another rally on Wednesday. As the special counsel’s investigation continues, we can expect more of these campaign-style events to distract Trump from his legal and political troubles. He’s determined to hold onto the 35 percent of Americans who still approve of the job he’s doing as president, while ignoring the rest of us.